When you don’t have time and want a curry that is both healthy and tasty and gets done really fast, then this curry is ideal for you. It gets cooked in about 10 minutes and needs preparation time of just 5 minutes. Take a pressure cooker; add the washed Masoor dal, tomatoes, garlic, chilli powder, turmeric powder and 1 cup water. Mix well and cook for 5 minutes or 1 whistle. Meanwhile heat oil in a pan, add mustard seeds, curry leaves, cumin seeds, dry red chilli, asafoetida, onions and salt and sauté till onions turn golden in colour. Then open the lid of the pressure cooker, coarsely mash the dal and add it to the pan. Mix well, check for salt, add ½ cup water and bring to a boil. Switch off the gas and serve hot with rice, dosa, idly or roti. Masoor dal curry looks so yummy n inviting....quick menu indeed!!! Wat a comforting dal,looks fabulous and inviting. 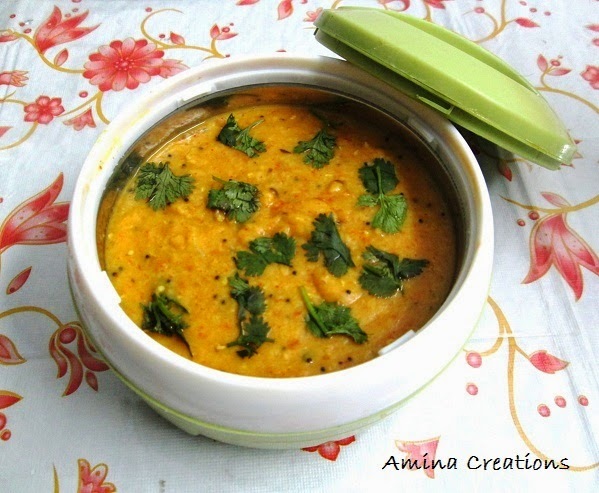 simple yet always appealing dal - looks warm and delicious! Perfectly made..yummy dal! !love this dal a lot..with half a lemon squeezed.. Delicious dal. I never add so many things to my dal, I should try it your way. Dhal is my all time comefort meal. Superb. This is my kind of dal - yum. simple, delicious and healthy dal, a quick recipe..
Nice dal recipe...I love any kind of dal preparation....and thanks for visiting my blog and your sweet comments...do keep visiting.